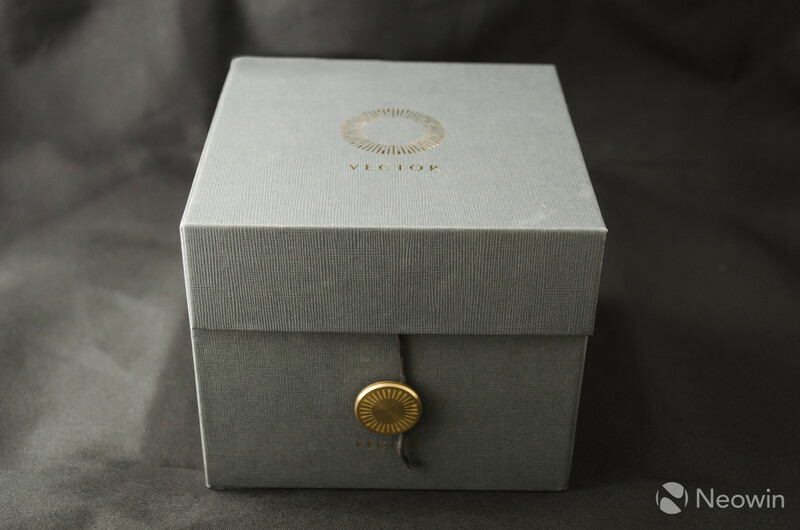 The Vector Luna smartwatch is making its claim to fame with a combination of stylish design, band and face customizations, luxury appeal, and thirty days of battery life. On paper, that sounds like everything you’d ever want from a device you wear on your wrist all day, but does it actually hold up? 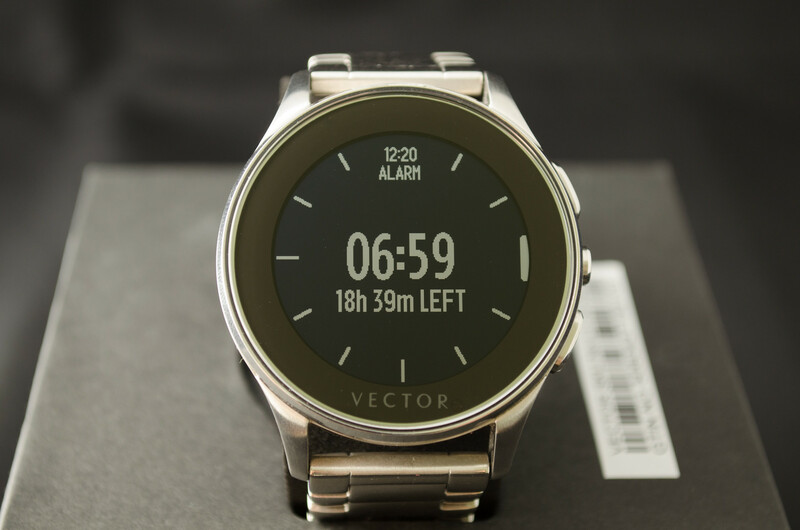 Vector is probably a company you’ve never heard of and you’d be forgiven for dismissing its smartwatch as just another “me too” device, like the countless others that have flooded the market in recent years. But that would be doing a disservice, not only to the company, but also to yourself as a potential buyer. The Luna has a lot to offer - if customers are willing to overlook some of its faults. 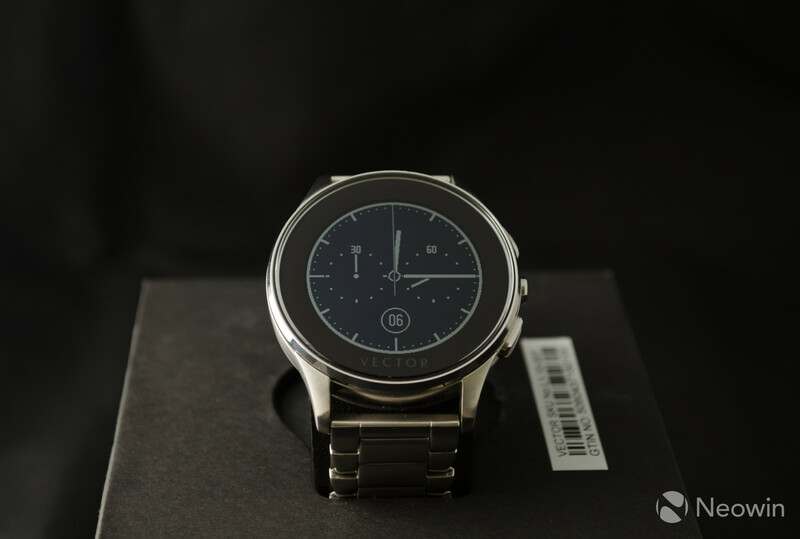 The Luna smartwatch is probably my favorite smartwatch so far. It looks good, feels great and hides most of its technological chops under a heavy layer of class and classic design. I’ve gotten quite a few compliments while wearing it in the real world and lots of people get intrigued when I tell them it actually does a lot more than just tell time. 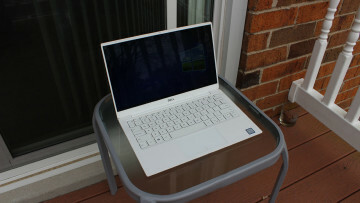 Its battery life is as amazing as the company claims, possibly lasting even longer than a month. But that comes at the cost of a low-resolution monochrome screen, and apps that barely do anything and occasionally don’t work at all. The device is great at bringing you notifications, but it can’t do much more than that in its current state. 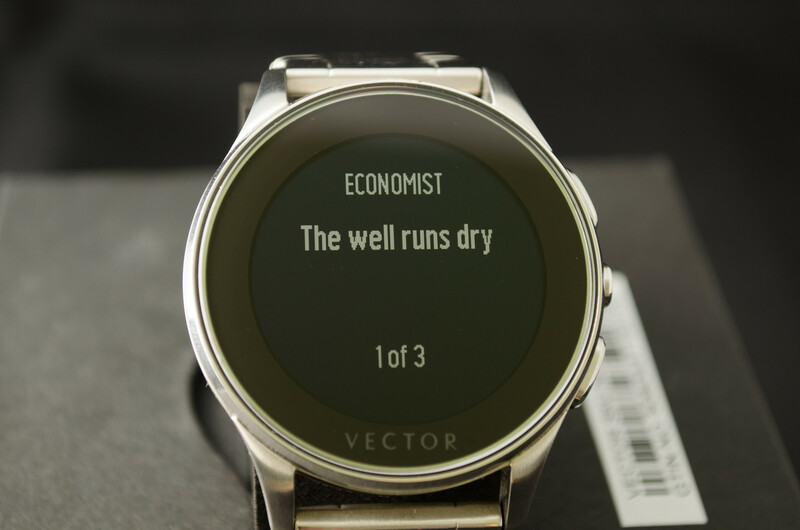 Compared to other smartwatches, that’s a letdown. While I have enjoyed the watch greatly, given the faults mentioned above I would recommend most people wait for version two. If it ever comes out, it’s likely to be a winner. 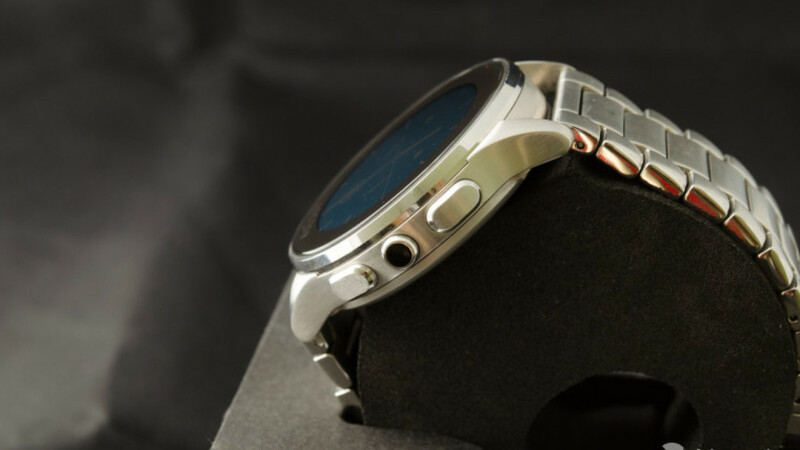 Looking at the wearable market today, you see that many companies which are dabbling in the smartwatch sector, are putting a strong emphasis on the “smart” bit. Even Apple, which focused so much on lifestyle, design and fashion in its Watch marketing materials, came down on the side of “smart” in the actual product. What do I mean by that? 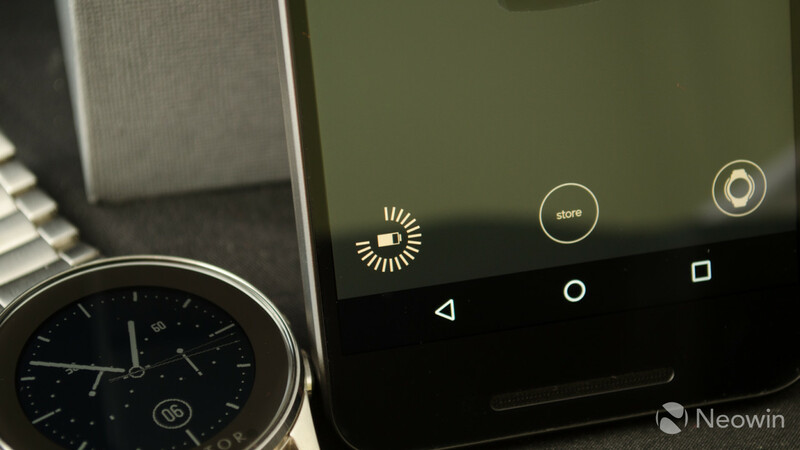 I mean that most companies focus more on bright screens and fancy apps, leading to ridiculously short battery lives and convoluted user interfaces for most of the smartwatches of today. 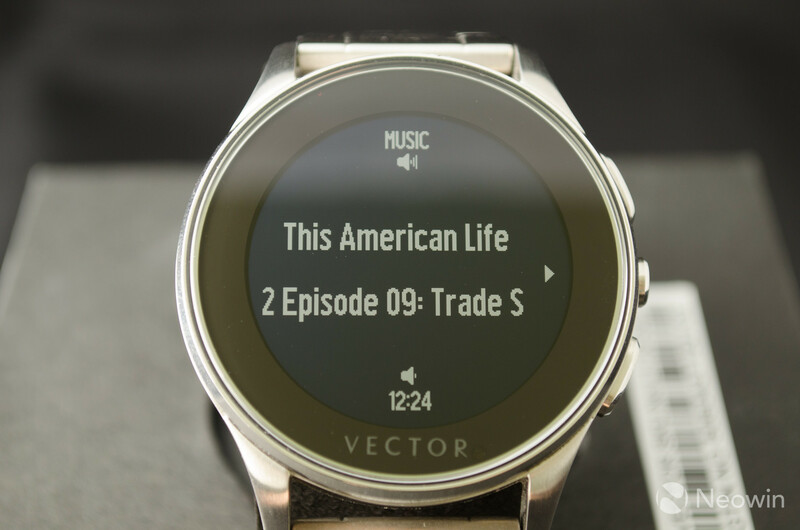 In many ways, Vector, with its Luna and Meridian smartwatches, is taking the exact opposite approach, emphasizing the design, feel and style of their devices. 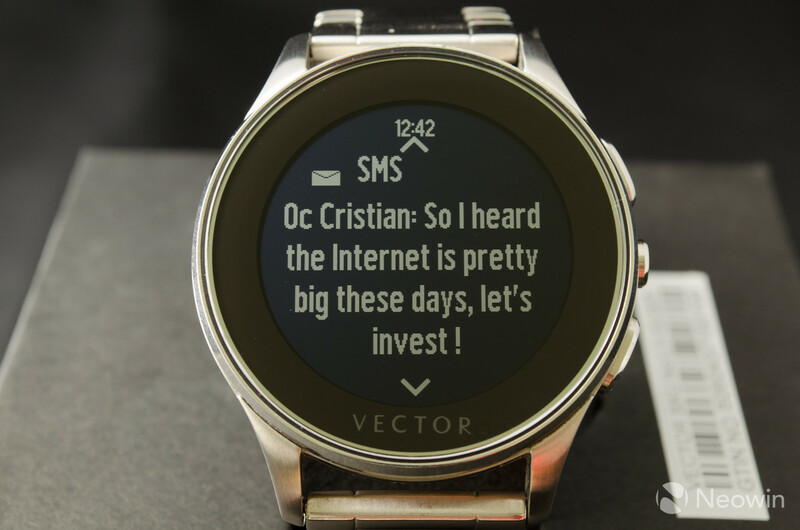 In other words, the company is putting the “watch” back into smartwatch. And that approach, may just prove to be the one that wins out in the end - at least with buyers like me. 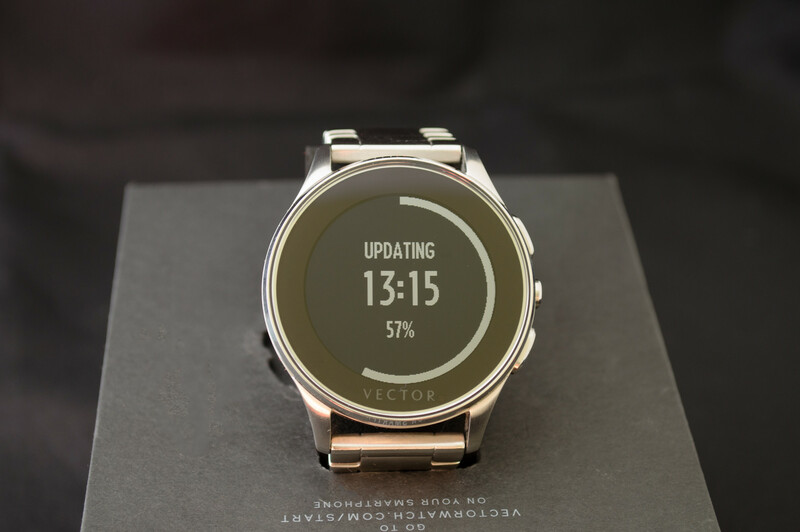 The Luna is taking a so-called modern approach to the smartwatch, ditching the rectangular LCD screen that's easier to manufacture, and going for a fully rounded display, a path more and more manufacturers are taking. 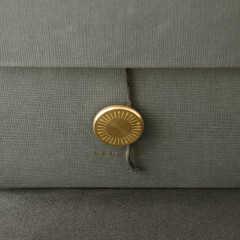 In that way, the Luna looks the way a watch is expected to look: round face, round screen, shiny ring up top, and a few brushed metal buttons on the side. 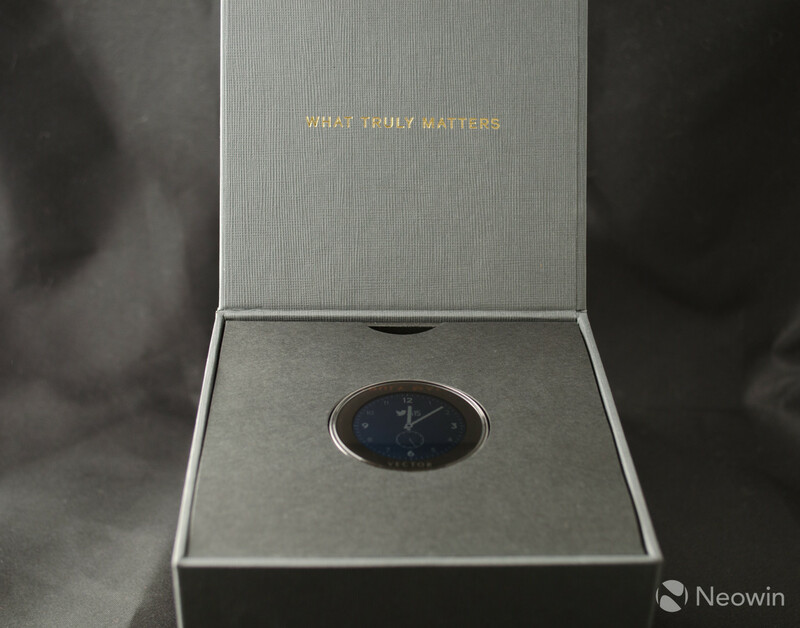 In most circumstances you probably can’t tell that this is actually a smartwatch until you get up close with it. In terms of size, as originally mentioned in my unboxing post, the Luna is by no means subtle. 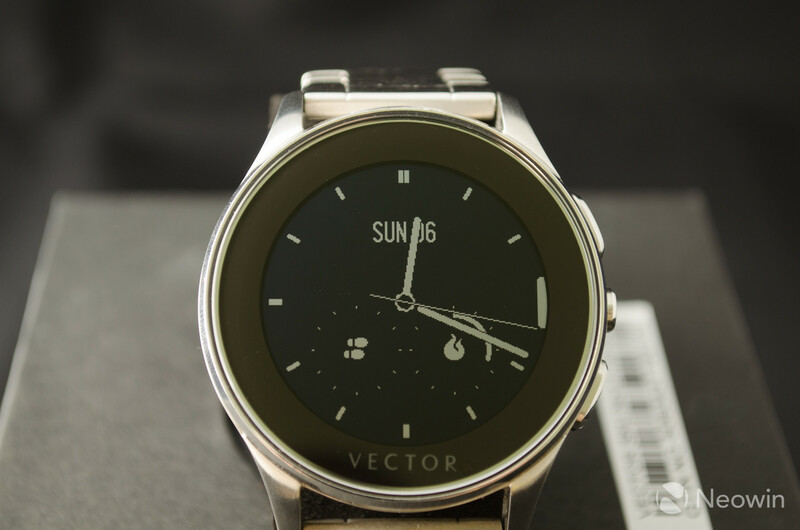 Both its face and its overall size are considerable, though not ungainly or more so than other smartwatches, nor indeed some regular watches. 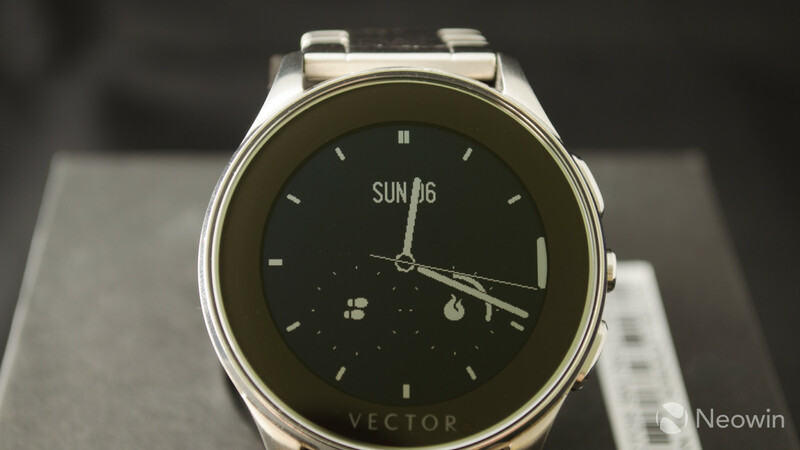 The Vector Luna has a hefty weight to it as well, especially if you go for the stainless steel strap. 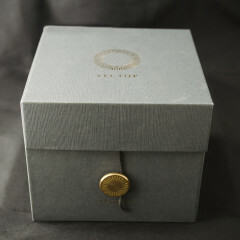 But that’s not only expected of a watch of this size and quality, but also welcomed. Personally, I always enjoy watches with a bit of weight behind them. As the old adage goes: Heavy is good. Heavy is reliable. 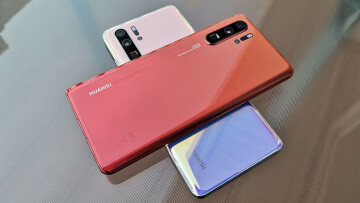 Looking at the device’s screen the first thing I noticed was that it was considerably smaller than originally expected. 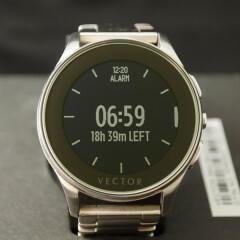 Don’t get me wrong, I don’t think Vector is trying to swindle you with a smaller screen than advertised, but the bezel around the screen is a bit larger than you might expect, and indeed than I wanted. I’m guessing it’s that way because of the technology used and because it’s also meant to cover up the screen’s connectors. 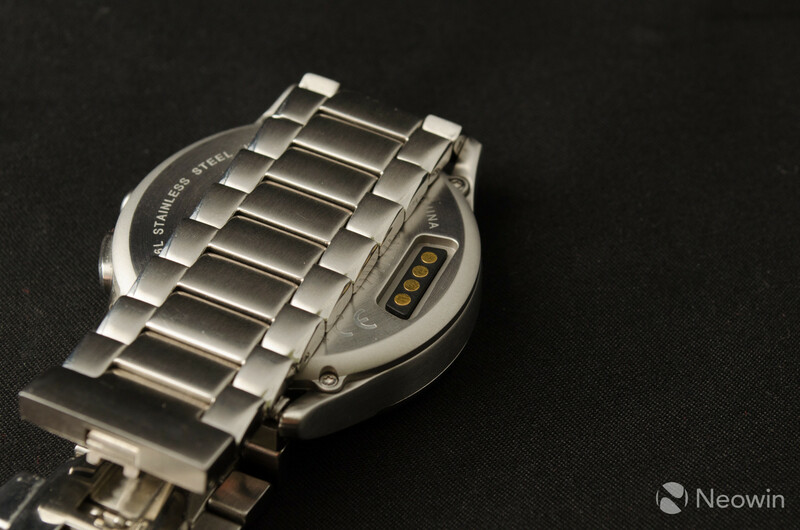 Unfortunately, this also leads to another issue where if you look upon the watch face from an angle you clearly see the demarcation between the bezel and the actual screen, which seems to be a bit lower inside the watch. It’s a bit of a weird 3D effect, and while you quickly get used to it, I believe it’s one of the big factors that takes away from the impression that this is one contiguous regular watch face. Having the screen and the bezel in the same plane would have definitely helped with that illusion. Going around the watch you’ll see its three buttons on the side, used for navigation, dismissing notifications and using apps. 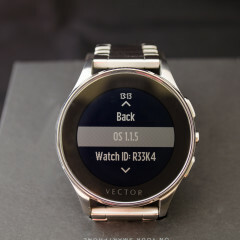 I’ll get more in depth on those features later, but right off the bat, the watch’s UI and apps are limited by the lack of a touch screen and just three buttons. But for now, let me mention that those buttons feel great: they’re not too easy to push so you don’t hit them accidentally, and they’re easy to find and are the right size to be confidently pressed without hitting more than one at a time. 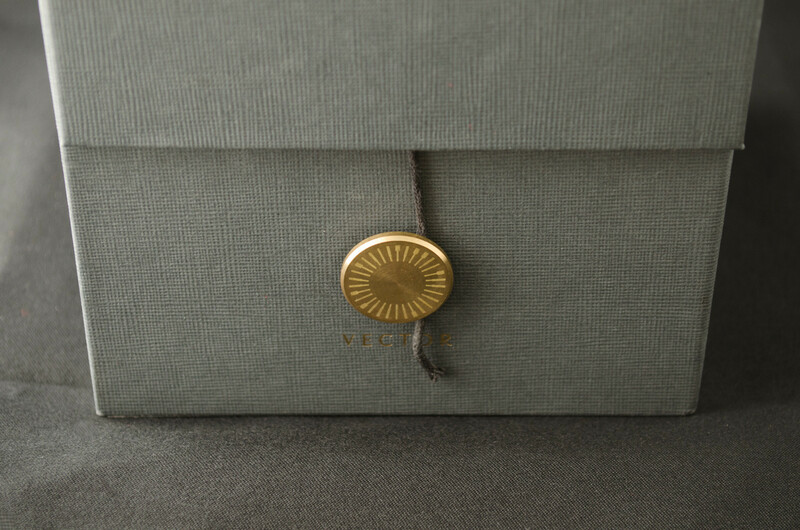 You may say “a button is just a button” but when it comes to watches, feel and class trumps almost anything. On the back of the device you’ll find the charging and connection port. There’s not much to say about it as there’s nothing special going on. It’s a magnetic dock that fits nicely and easily with its charger and only goes in one way. 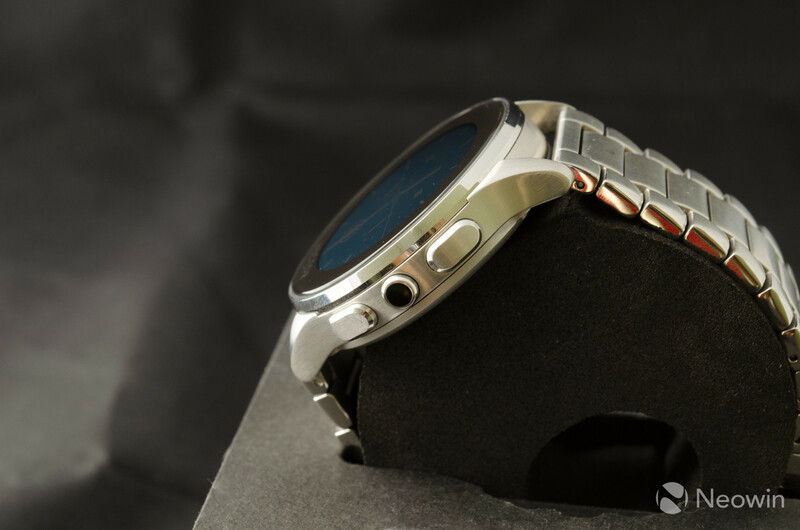 Besides charging the device, this is of no interest to normal users, as the watch only pairs with smartphones via Bluetooth LE. 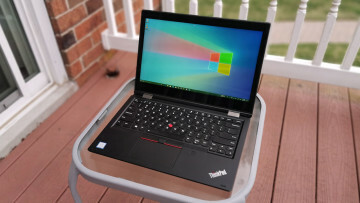 There’s no wired connection in regular usage, though you can connect the device to a PC via a Chrome plugin and additional drivers. 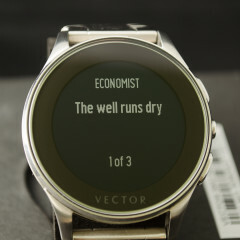 The watch is also water-resistant. Everything fits nice and tight together and the device is rated for 5 ATMs. That means that, at least in theory, you should be able to swim with it. While I’m not sure I’d recommend that, I did wear it in the rain, while working out and while showering and it behaved perfectly. I also dropped the watch in a jug of water and kept it there for a couple of hours without any adverse effects. Now there’s one final important aspect that I wish to mention here and that’s comfort. 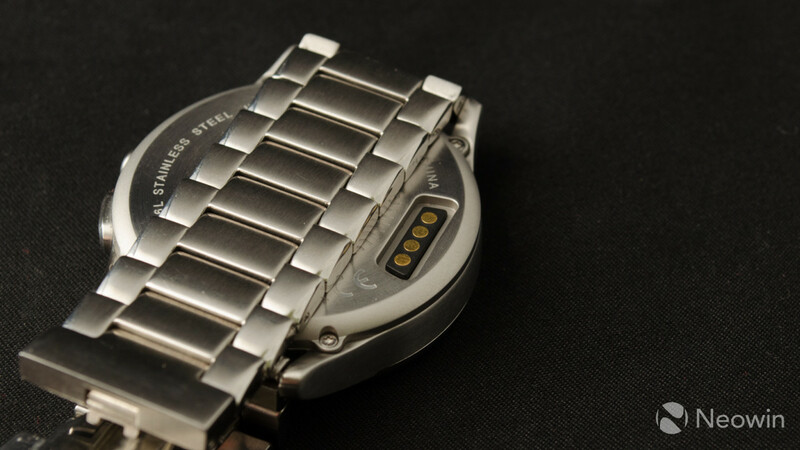 The Luna watch is surprisingly comfortable, even in its stainless steel strap version. I’m not sure exactly whether it’s the butterfly clasp, the brushed metal or its weight distribution, but the Luna ended up being more comfortable than I was expecting. It even felt better than my own Slow watch, which has a leather strap and which I generally love. There’s not much point in talking about a smartwatch without going into what actually makes the device smart, so let’s do that. 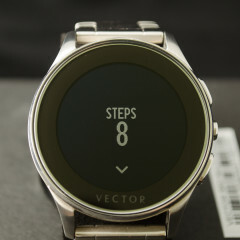 The first time you use the watch you’ll need to set it up and connect it with your smartphone. 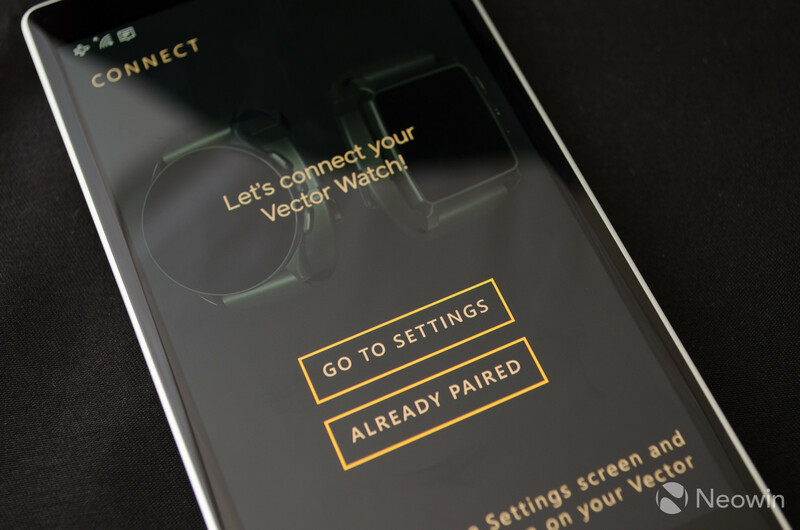 One of the most attractive features that Vector offers is the company’s cross-platform compatibility. 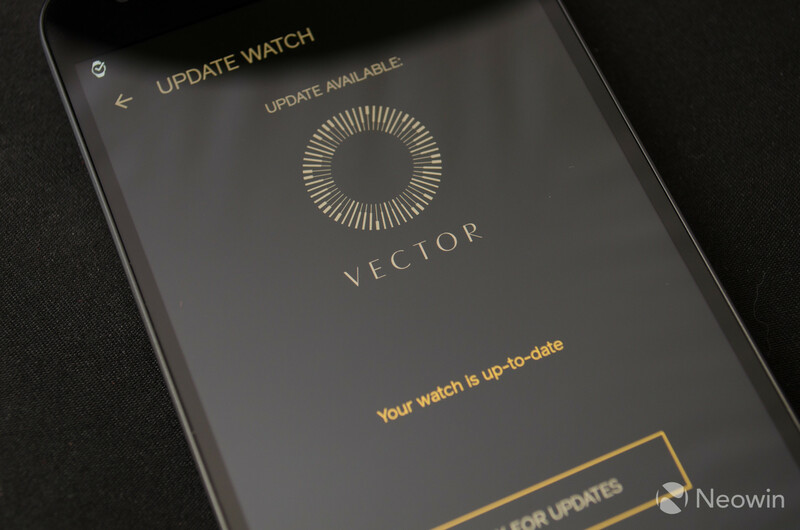 The Vector Watch app is available on all current versions of Android, Windows Phone/Windows 10 Mobile, and iOS. 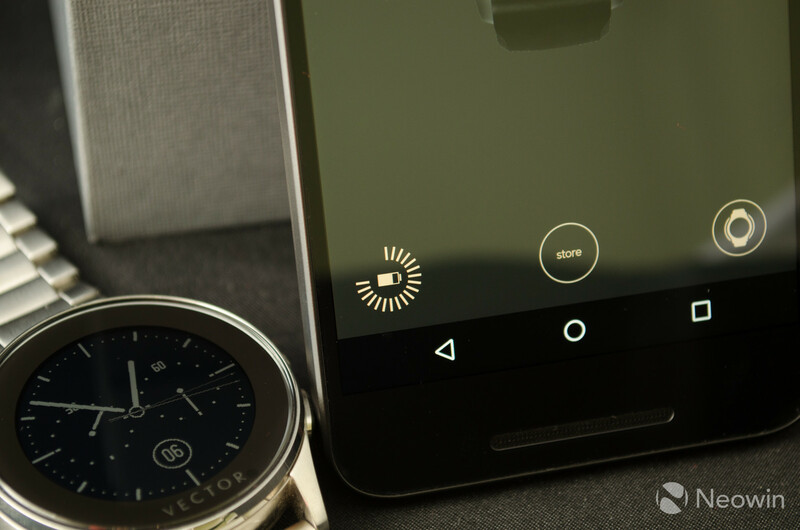 Once the app is downloaded you’ll need to pair the device via Bluetooth, which is a pretty straightforward process. Next up, the app will check for updated versions of the OS and will most likely update your device. Curiously enough, the app might actually downgrade your watch's OS, kernel and bootloader versions to fit the phone you’re using. 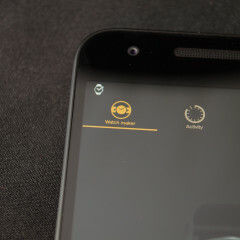 For example, when connecting to Android my watch went from version 1.1.0 to 1.1.5, but connecting to Windows Phone led to a general downgrade to 1.0.1 and kernel version 1.0. While cross-compatibility is great, it’s very peculiar when this happens at the expense of functionality and improvements. The downgrade on Windows Phone essentially left me with a smartwatch that had fewer functions, more bugs, and less accurate sensors. What’s worse is that the whole process takes around ten minutes. I’m not sure that’s a strong selling point. 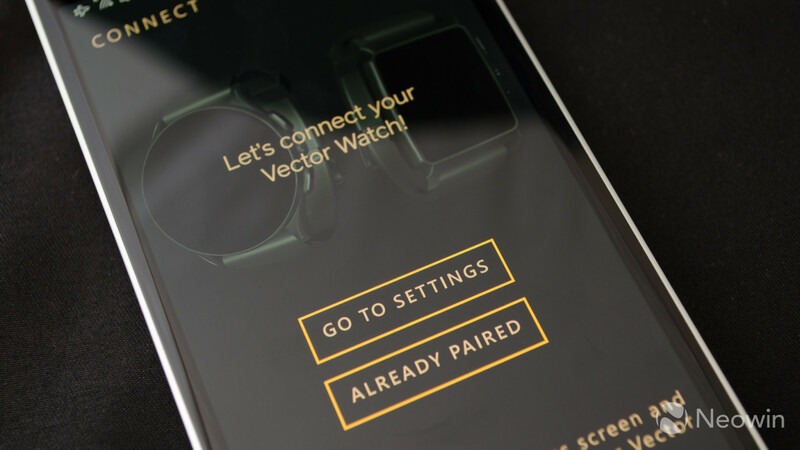 In either case, once you go through the first setup and your watch is connected, you’ll be able to customize it to your liking via the app on your phone. This is the device’s main hub and where you’ll perform most settings. 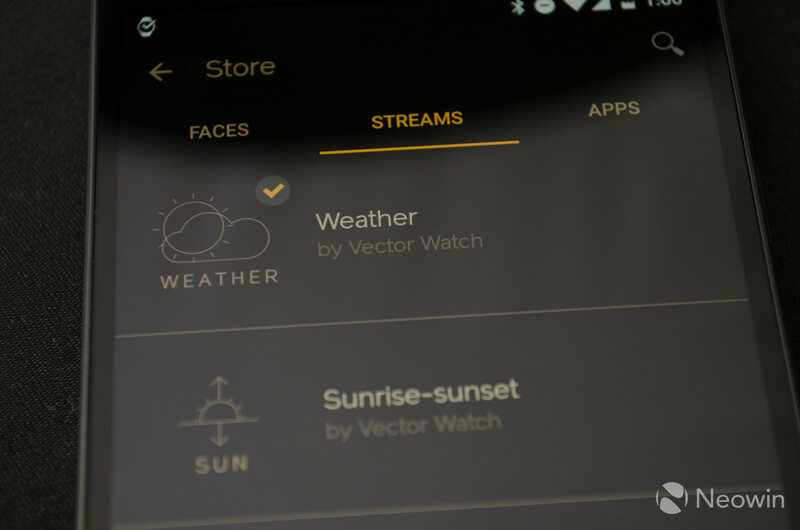 In the app, you’re able to select your desired watch face, or indeed faces, as you can scroll through a number of favorites on the watch. You’re also able to download extra faces from the so-called Store, although all available options are currently free. 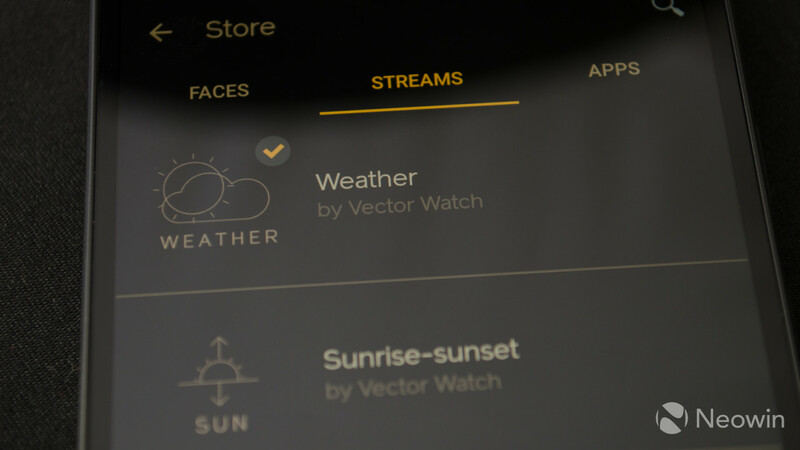 You can also download “Streams” and “Apps” that you can add to your watch face as a complication or use independently. 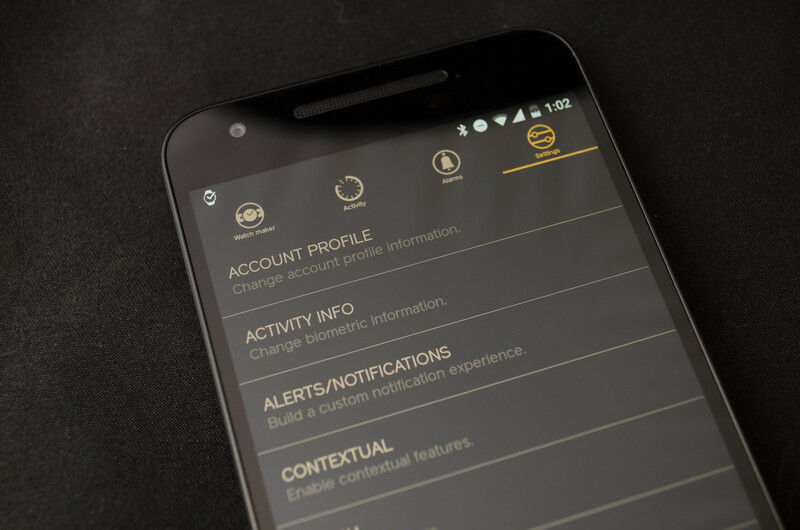 Finally, you’re also able to select your desired notification settings, including on an app-by-app basis on Android. 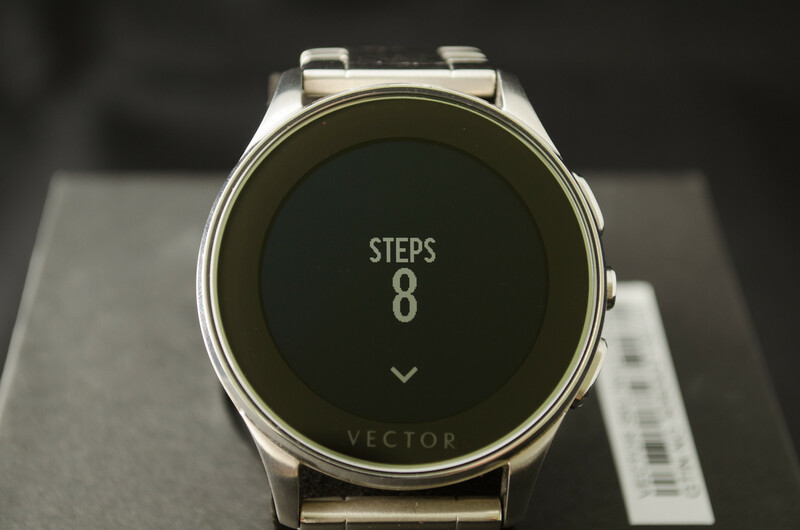 You can also input some personal information, like weight and height, so the watch can track your steps and calories throughout the day. 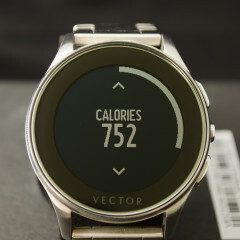 Yes, the Vector Luna also doubles as a fitness device, though as I’ll explain later, it’s not a great one. 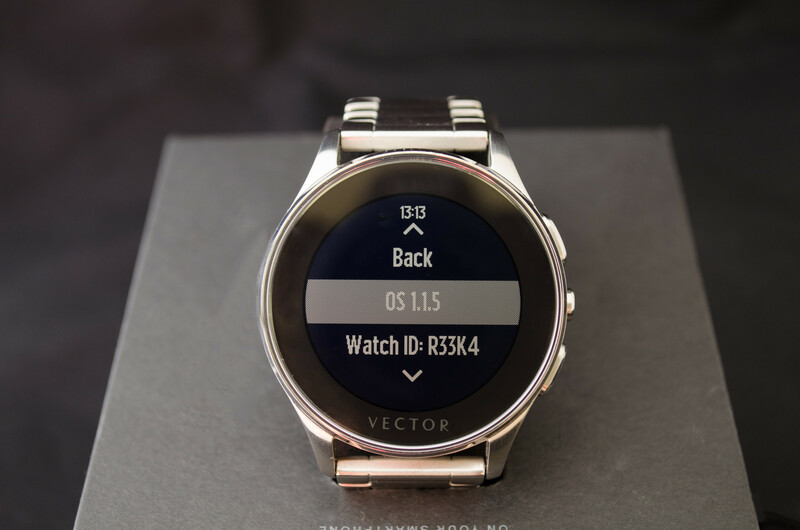 Smartwatches offer users the ability to customize the way their device looks, at least on its face, and that can be a big plus for such a device. 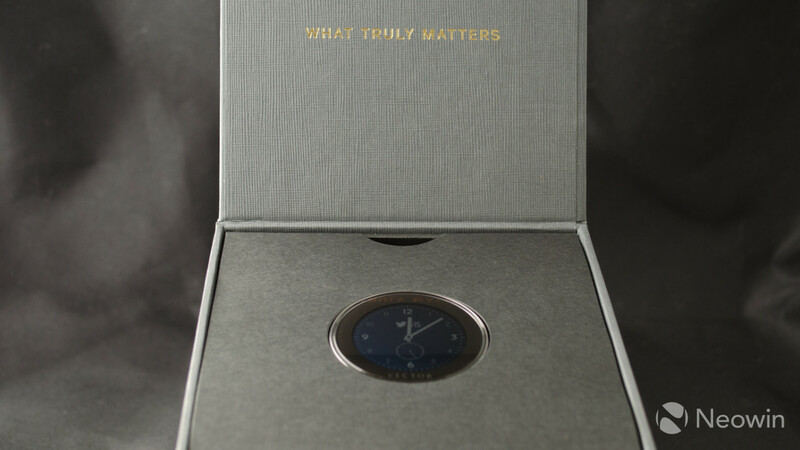 While many screens may not look as beautiful as a regular watch’s face, that bit of extra personality that you get with a custom digital design can go a long way, especially with devices that are mainly decorative accessories. Right now, based on which OS version and phone you’re using, you can get somewhere between seven and twenty-five different watch faces for the Luna, alhough many of them seem to be variations on the same theme. 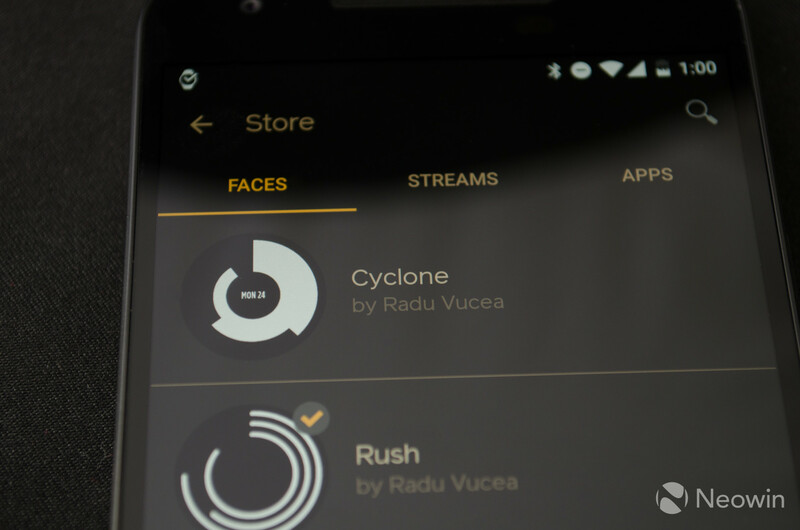 I’m guessing Vector plans on selling some specially designed faces in the future, but so far all of them are free. Once you’ve chosen your desired face, or indeed more than one - as the watch can hold up to twelve faces - you then get to choose which complications get added to it. 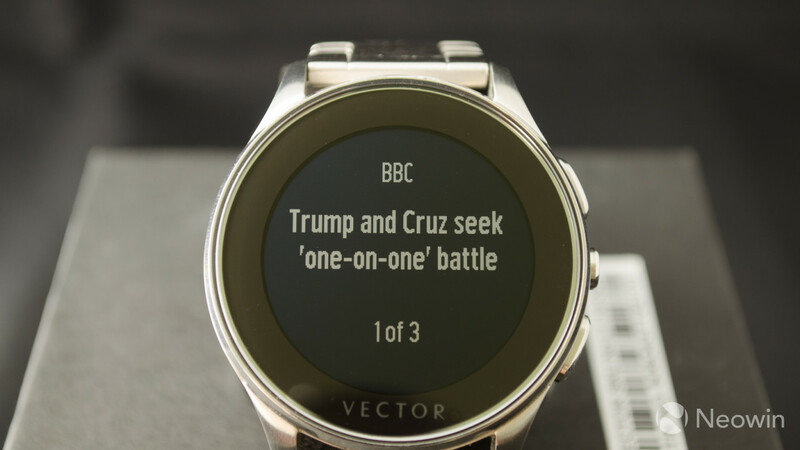 Translating from “watch speak”, complications are simply added functions, which can be as mundane as showing the date, or as complex as a Twitter stream. Each face may hold up to three complications, and you get to decide which ones it uses, though some fit in better than others. To be honest, the weather stream ended up being the only one that I consistently used, but I also tried out the social streams, aka Facebook and Twitter. Neither does anything interesting. Twitter allows you to see how your last tweet is doing in terms of likes and retweets, as well as your overall number of followers. Twitter can also show the top three trends at the moment. Facebook can be set to show you either your own profile or a page that you’re administrating, with the number of likes and messages on your last post, or the next upcoming event in your Facebook calendar. Other streams include things like weather, time zone, sunrise and sunset times, distance walked, next event from your calendar, stocks and a few others. 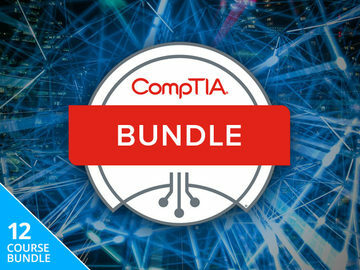 Also worth emphasizing is that not all of these are available on every platform. 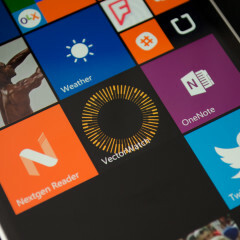 For example, the social ones are missing from Windows Phone. They all work fairly well, in that they update every few minutes and show accurate data. That being said, the watch faces you’re using and the position of the complication on it will make a big difference in experience. 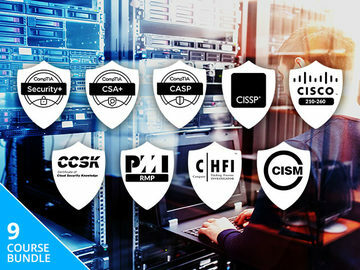 For example, many faces offer spots for complications on the side, but these look horrible if you use them with anything that’s more than an icon. Basically anything that needs to refresh the screen, such as a ticker with Twitter trends, looks bad and is a real pain to read, because of the screen’s refresh rate. Meanwhile, something like the Twitter icon with your number of followers, or a weather icon and the temperature look great and really fit in the overall esthetic. Still, as already mentioned, none of these streams are anything to brag about. They work fine most of the time and offer a tiny bit of information, but that’s about all they can do. Perhaps the very definition of a smart device is that it accepts apps that further expand its capabilities and offer new experiences to the user. The Luna fits into this category but just barely so. Let me expand. 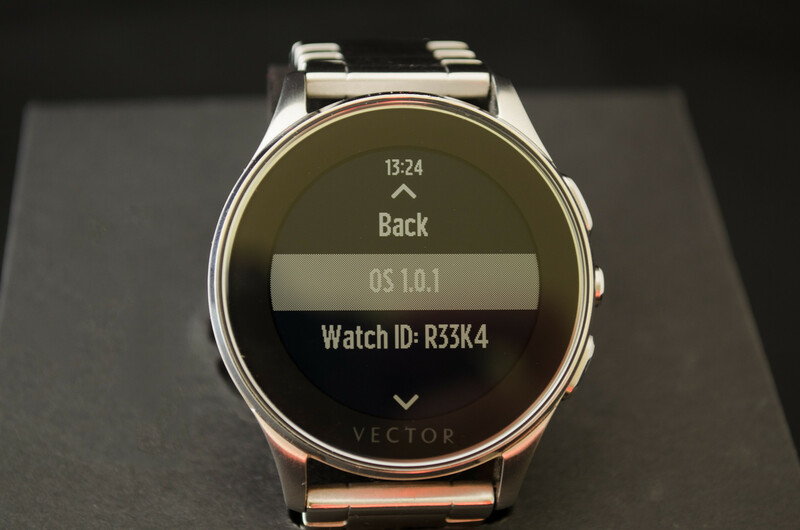 The first thing I need to reiterate is that Vector’s watches use a proprietary lightweight OS – this isn’t Android Wear, or Windows or WatchOS or anything that has an already-existing ecosystem. 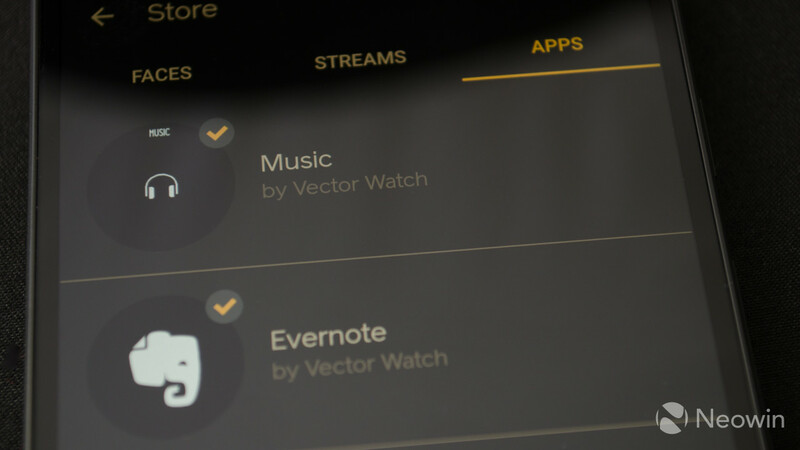 Vector decided to start from scratch and while that may be a laudable decision, it’s not necessarily one that favors the customer. 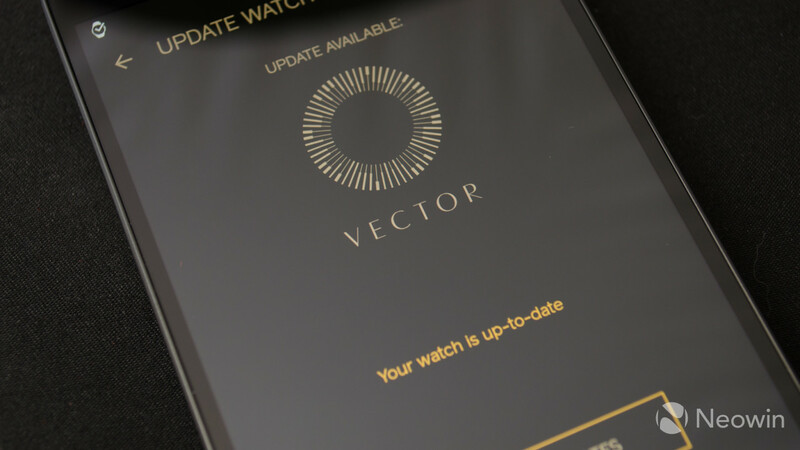 Despite the watch having been available on the market for a few months now, Vector hasn’t yet opened up its developer platform. 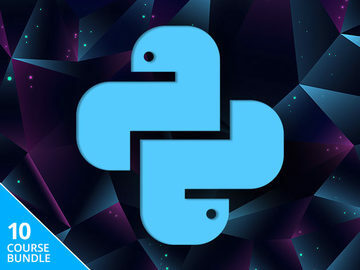 As such, the few apps that are available are developed by Vector or select partners. Just like with streams, some apps are only available on iOS and Android, so Windows users might miss out. That being said, currently, these were the apps available to me: Music, Evernote, Nest, Activity, Alarms, Timer, Stopwatch, Economist, BBC and a few other news sites. All of them are free; you download them from the watch app on your phone. To open an app on your watch you simply navigate up and down with the buttons, the same way you scroll through watch faces. 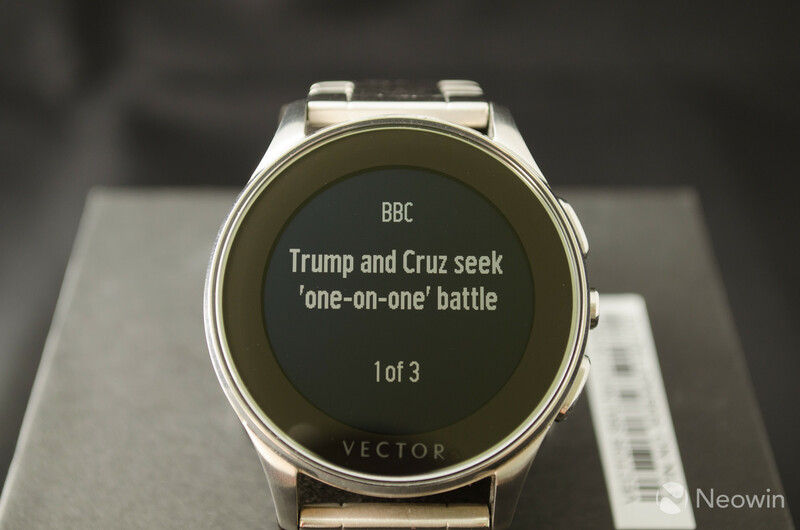 In fact, some apps come in the form of actual watch faces. 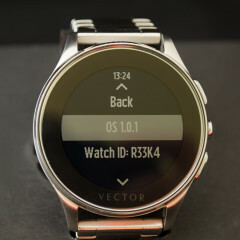 For example, the Activity app, which tracks steps, distance and calories, and the Alarms, Timer and Stopwatch app each comes with its own watch face. 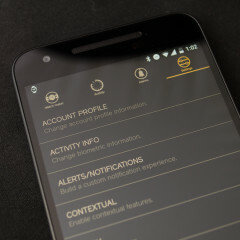 Once you’ve reached the app you want, you hit the middle button to open and close it, as well as use some of its functions. Unfortunately, most apps are barely more than small chunks of text, which supposedly refresh themselves. The apps department is by far the weakest link in Luna’s otherwise interesting value proposition. 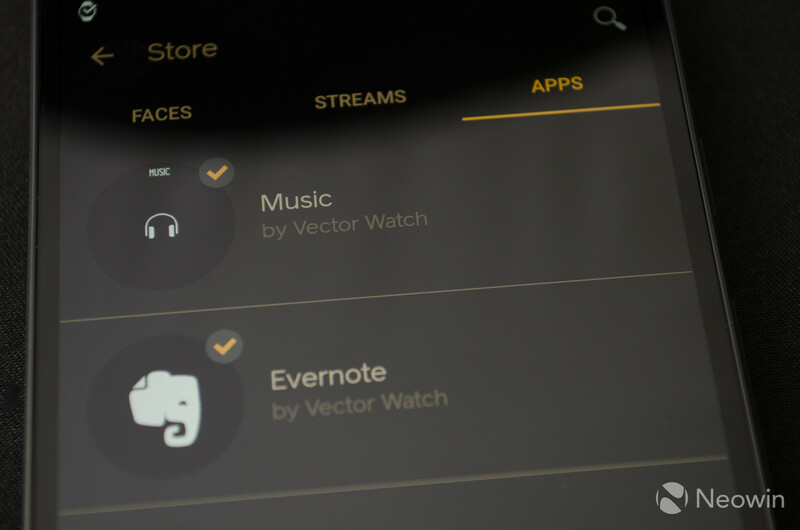 By far, the app that I used the most during my time with the watch was the Music app. 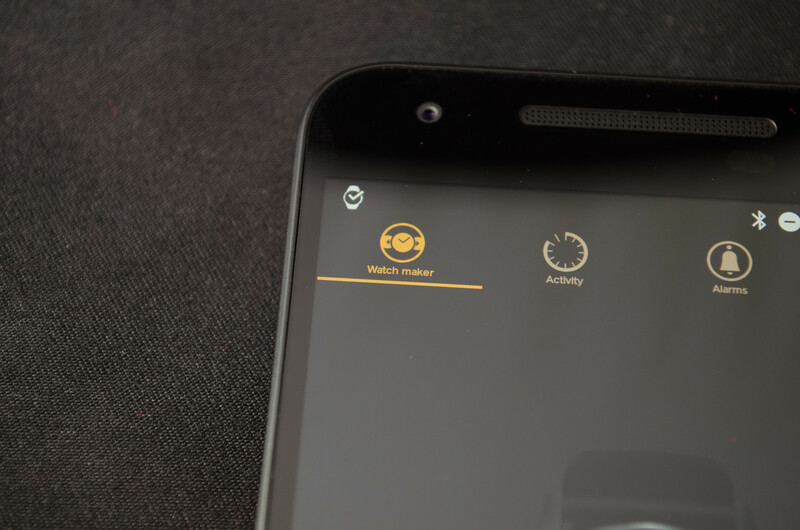 This allows you to partially control music playback on your phone. Why just partially? I don’t really know, but you can only stop and start music and adjust volume. There’s no skipping, no rewinding and no fast forwarding. 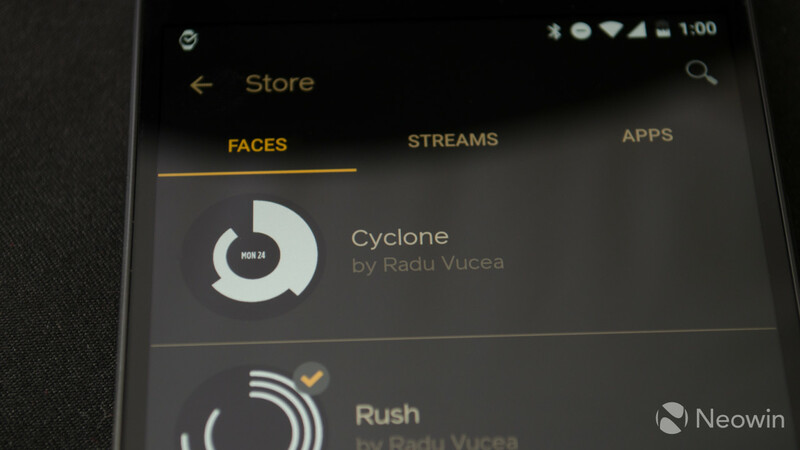 The app also displays the artist and song name. It works fine for what it does but it’s inexplicably missing some basic functionality. Then there’s the fitness-tracking Activity app. 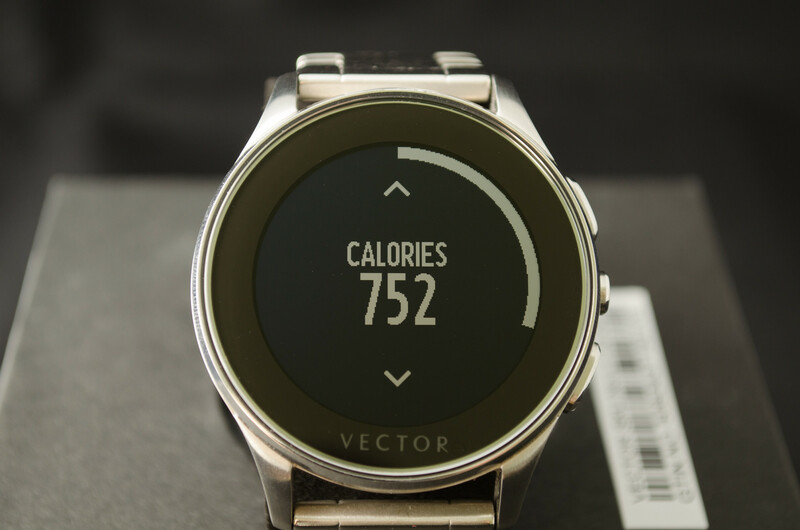 It tracks your steps, the distance you’ve walked and the approximate number of calories you’ve burned. That’s about it in terms of functionality, and as for accuracy, it’s been hit and miss. I’ve compared its readings both to my phone directly, and to two different Fitbits, and while all those three devices came out pretty close to each other, the Luna seemed to oftentimes forget to count. To be fair the company released a software update that I just got today, which addresses some of these issues and supposedly leads to more accurate tracking. Of course, as mentioned previously, this isn’t actually available to Windows Phone users yet, so I think my conclusions are still valid for now. Moving on, there a bunch of news apps available, including one from the BBC – though it’s actually developed by Vector. All of these apps behave in exactly the same way: once opened they show the top three headlines from the publication. That’s it. There’s no sharing, or liking or any type of further interaction. And to make matters worse, these apps seem to not even update themselves correctly. As a matter of fact, I still have the exact same BBC headlines that I got two weeks ago when first opening the app. Reinstalling the apps helps, but they seem to occasionally get stuck. The last app that I tried was Evernote. This did exactly nothing. I’m not even joking, the app just opens, says it’s loading something and then displays a white line across the screen. It’s not stuck, it just doesn’t do anything. 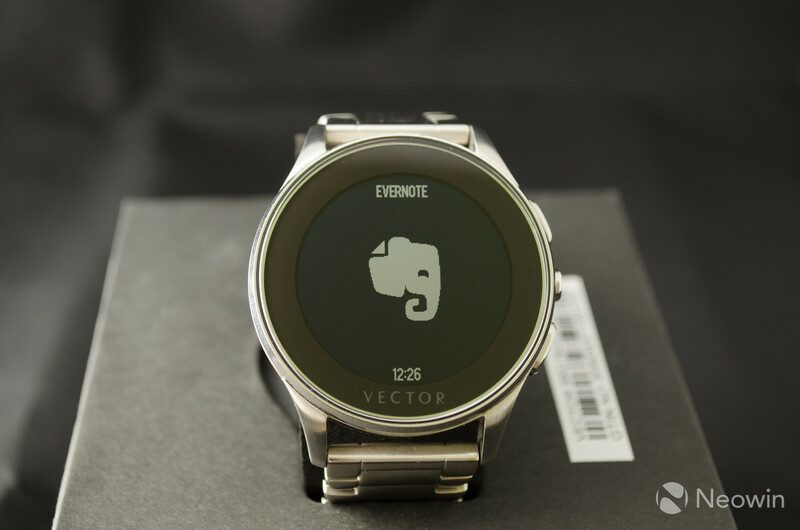 I’ve tried reinstalling it, rebooting the watch, factory resetting it, and even creating a new Evernote account but none of it worked. I honestly don’t even know what the app is supposed to do. 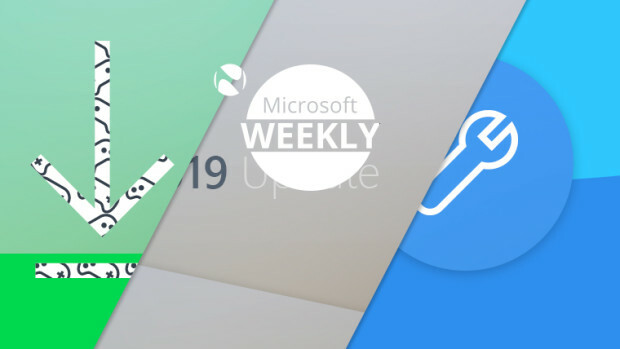 Finally, there are a number of high-profile apps that are supposedly coming soon. Unfortunately, they’ve been coming soon for quite a number of months now, but so far they haven’t materialized. These include Uber, which was supposed to be released yesterday but was held back at the last moment. British Airways and Sonos are other apps scheduled for the future. 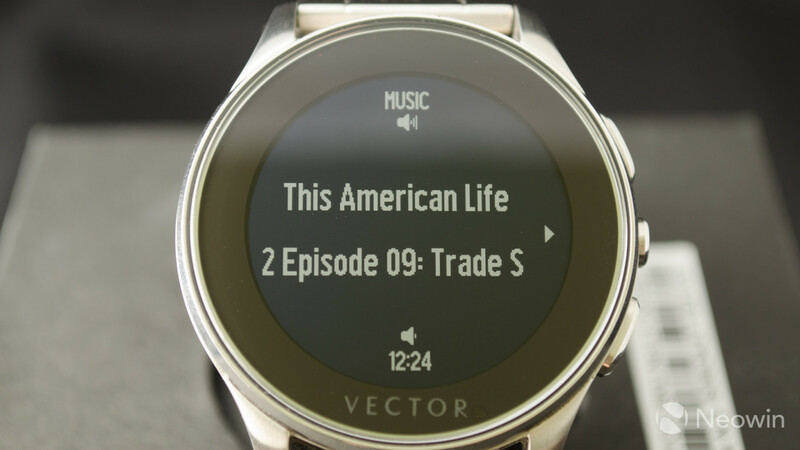 There was also lots of talk of bringing IFTTT functionality to the Vector smartwatch when it was originally announced. I’m not sure if the notification backend is based on IFTTT as some have claimed, but that doesn’t seem likely. And there’s no other public mention of such functionality either in the app or in the watch’s settings. Unfortunately it looks like those efforts never panned out. 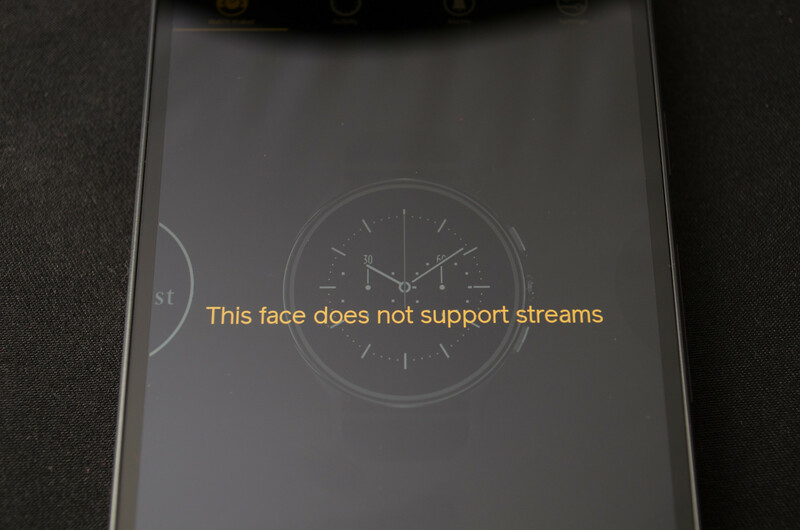 Overall, as you can see, the app experience on the Vector Luna is quite poor. Though keeping apps as lightweight as possible helps with the battery life, most of these offerings are beyond bare-bones. And some don’t even work. 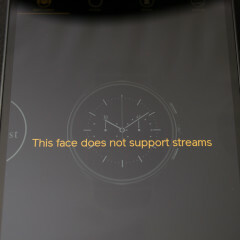 This is by far the most disappointing aspect of the watch. 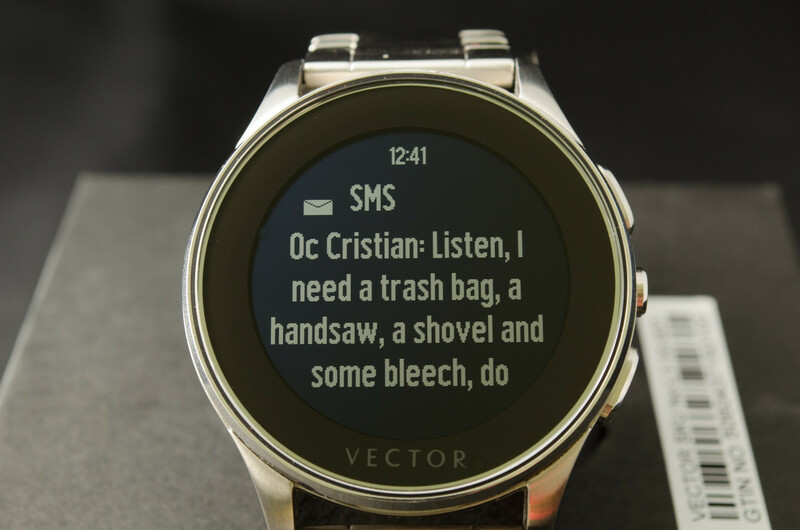 The Luna smartwatch can mirror almost all of your phone’s notifications. You can change this behavior, including on an app-by-app basis on Android, in the smartphone watch app. I’m glad to say notifications work quite well. 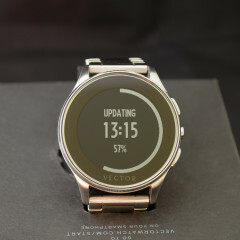 When you receive a notification on your phone, the watch will vibrate almost at the exact same time, and display its so called “notification ring” around the watch face. 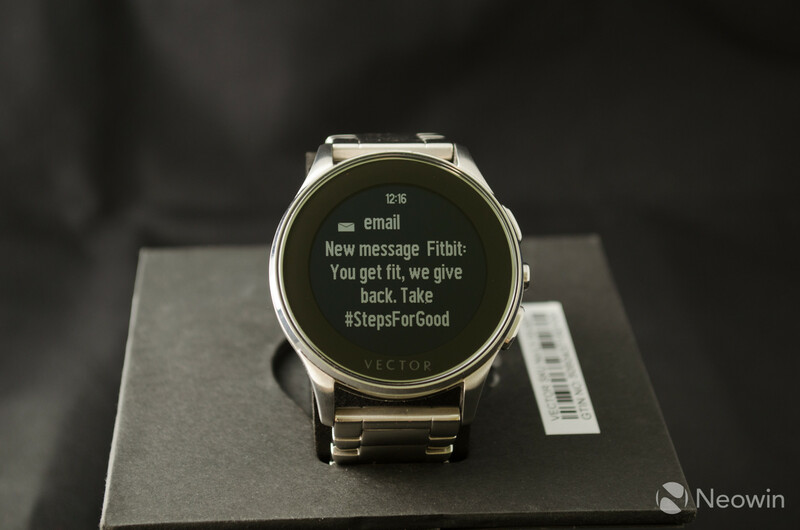 The watch can store up to ten notifications and display them one at a time. When its memory gets full it will delete the oldest and keep the newest. 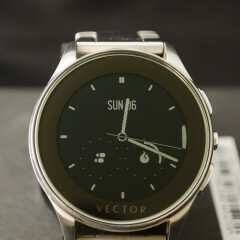 You can set the watch up in such a way that it displays notifications whenever you look at it. 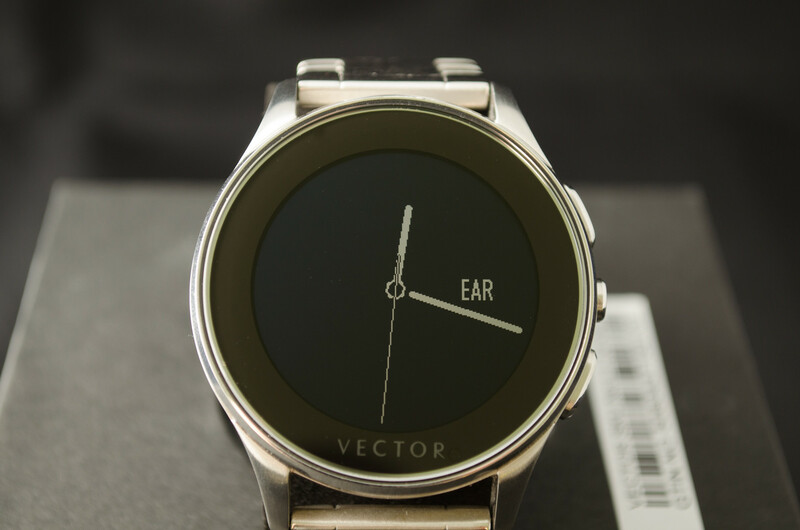 This is based on your wrist movement, just like 'glance' works on other smartwatches. 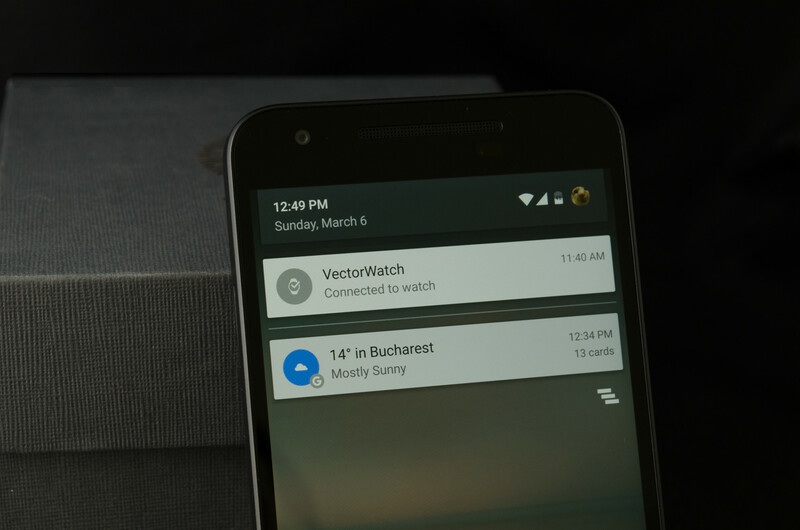 You can also dismiss notifications with a flick of your wrist. Both of these abilities work fairly well, although you might need a bit of practice before you get the hang of it, and you generally need to exaggerate movements before the watch actually does what you want. 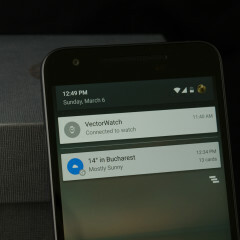 It can also be easy to unintentionally dismiss notifications if you’re moving your arms around. Luckily you can change this behavior from the Settings panel, so notifications only get displayed and dismissed when you press the watch’s middle button. This is also where you can enable 'auto-discreet' mode that turns off watch notifications when it knows you’re in a meeting. This obviously works with your calendar. You can also “optimize your notifications experience” so that notifications don’t forward to your watch when you’re navigating on your phone. In terms of what you actually get with your notifications, the Luna is a mixed bag. On the one hand I received subtle vibrating notifications for pretty much every mail, text, call and IM, not to mention Twitter event, that I got. You generally see the app that’s notifying you, the sender and the top line of the message, or the subject line for an e-mail. Unfortunately, you can’t actually scroll through the full message, nor interact with the notification in any way. This wasn’t a problem for me. I generally relied on the Luna to see whether a notification on the phone is something important or not, and then dismiss it. 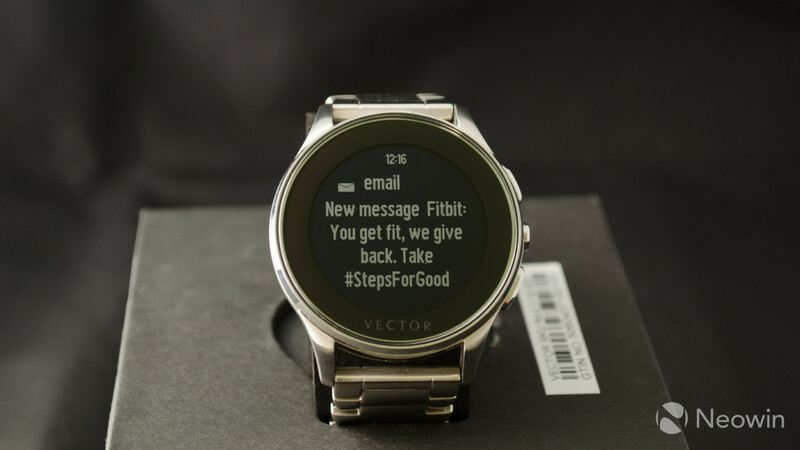 But many people would also want to take some sort of action without having to pull their phones out; after all, that’s in many ways the point of a smartwatch. And that aspect is completely missing in action. The only actionable notification you get is the one for phone calls, where you can dismiss an incoming call by pressing a button on the watch. I’ve found this useful especially while driving, since I didn’t actually need to take my eyes off the road. That being said, many people might find the lack of interaction with notifications a real disappointment. In the previous two sections of this review I’ve described quite a number of negative aspects and issues I’ve encountered with the Luna. 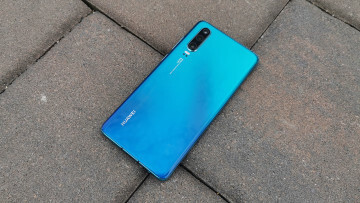 But most of those were actual limitations imposed by the makers of the Luna so that this one feature may outshine all the other contestants on the market. And to that end, I say they got the job done. The Luna’s battery life is stellar. 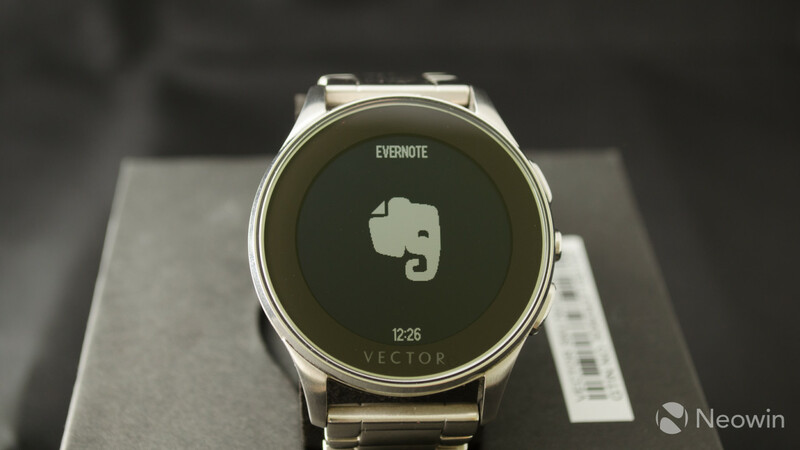 It’s absolutely incredible for a smartwatch, albeit wildly unimpressive when compared to regular watches. Vector says the Luna may last you up to 30 days depending on your usage. I’m here to tell you it might actually last double that amount. Yes, you read that right, the Luna may actually last for nearly two months without a charge. After my two weeks with the device, during which I never charged it and used it heavily throughout the day, I still had more than 65% battery left. 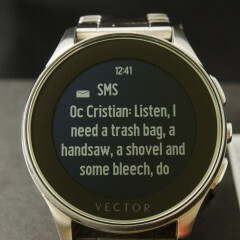 Keep in mind I receive hundreds of e-mails and IMs throughout the day, every single one of which made the watch vibrate and display a notification. I also kept the watch screen on all the time, as it’s designed to be kept. And despite all of that, I can probably finish the month without charging the watch and have zero worries that it will die on me. 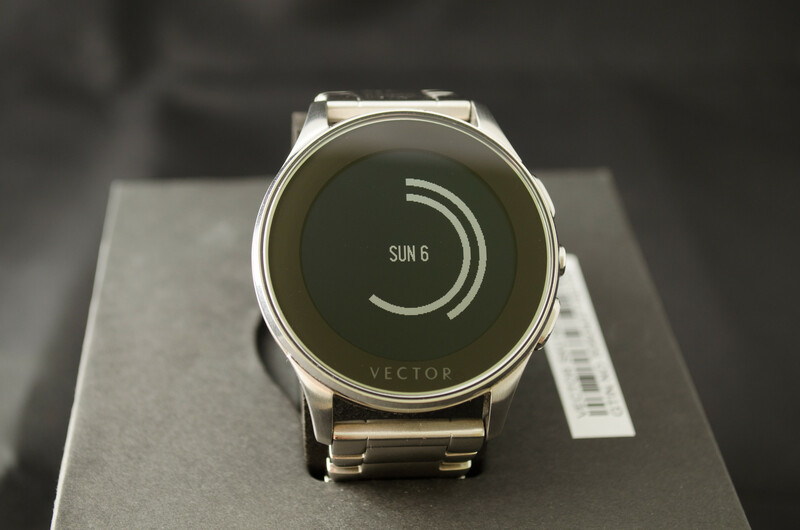 In terms of battery-life the Vector Luna is unequaled in the smartwatch world. This is a tough one. Personally I loved using the watch. Everything from its appearance, to its comfort, to the long lasting battery appeals to me and fits in very nicely with my needs and workflow. But that’s not to say the Luna doesn’t have major drawbacks. Notifications are dull, streams are uninteresting and the apps for the watch are a complete disappointment. While I may care little for those aspects, most people who buy a smartwatch, do it for those exact features. And in that sense, the Luna disappoints. 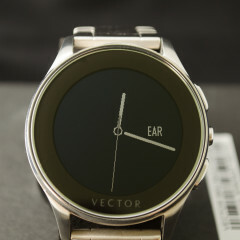 The watch also comes with a hefty price tag for what it’s offering. It's pretty much on par with some of Samsung’s offerings or the cheapest Apple Watch, at $349 for the silicone strap version. 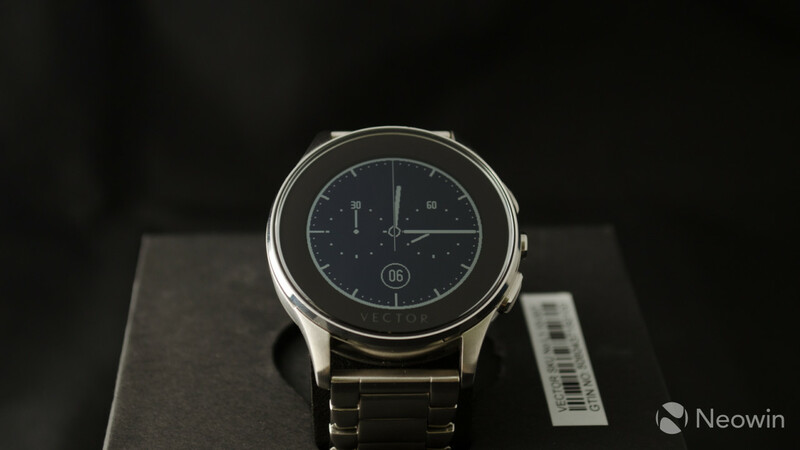 Unless you’re in a very niche demographic like me, that only wants very basic smartwatch functionality in a beautiful package, I can’t really recommend this watch. That being said I’ll be keeping an eye out for version 2.0. I’d gladly give up half the battery life for a better screen and good apps. 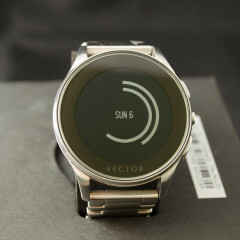 If that ever comes to pass, Vector may find itself becoming a household name in the smartwatch market. 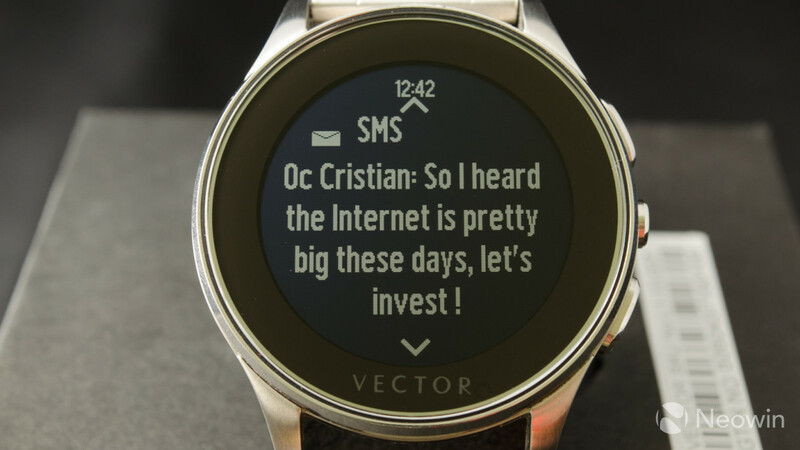 Thanks to Vector Watch and Orange Romania for the review unit! 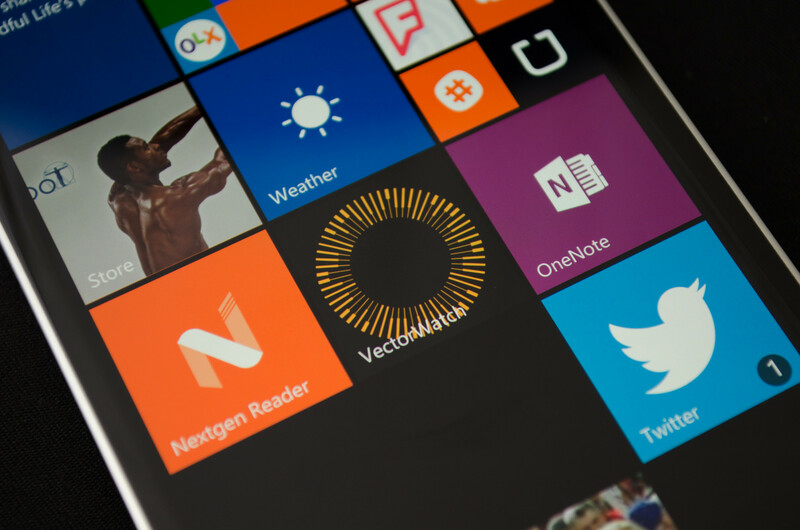 Discuss: Windows 10 Mobile upgrade - what, if anything, are you most looking forward to?